The entrance of Smallin Cave is roughly 55-feet tall and 100-feet wide. Smallin Cave Staff Archeologist Eric Fuller shines a flashlight on a cave wall believed to be inscribed with names from Civil War soldiers. Fuller shines a light on the stalactites, which are formations hanging from the cave's ceiling. The cave's concrete walkway dead ends at 550 feet. The main channel of Smallin Cave has been mapped to a mile. Henry Rowe Schoolcraft was the first to document Smallin Cave's existence, which he discovered during an expedition in 1818. A topographic map used by Dr. Milton Rafferty to map Schoolcraft's journey. 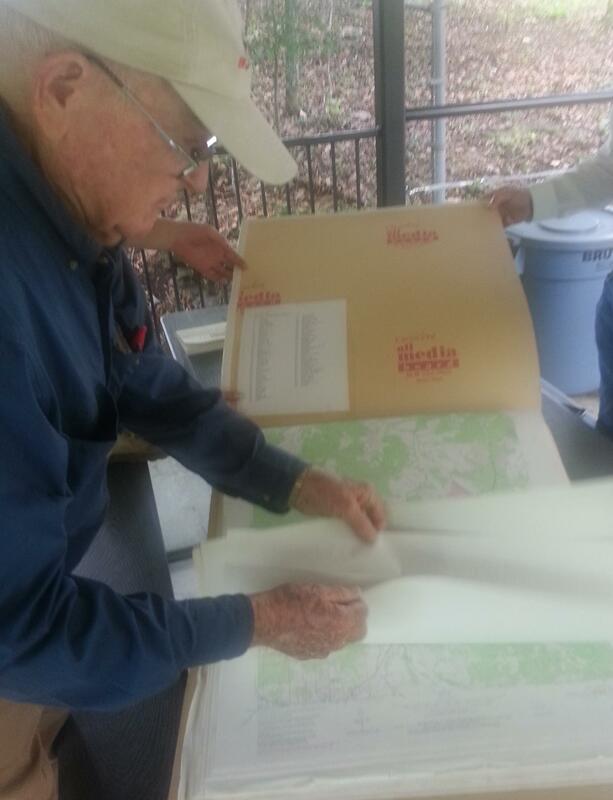 Dr. Milton Rafferty, author of Rude Pursuits and Rugged Peaks: Schoolcraft's Ozark Journal, thumbs through maps retracing Henry Schoolcraft's expedition. Rafferty, who wrote the book Rude Pursuits and Rugged Peaks: Schoolcraft’s Ozark Journal, is referring to Henry Rowe Schoolcraft, who along with companion Levi Pettibone began an expedition through this region in November 1818. “I often wondered why he waited until winter but I think he had been told that summer wasn’t a real good time to travel with all the ticks and bugs and stuff,” Rafferty quips. On this overcast June morning, our group has met northeast of Ozark at Smallin Cave, which is anything but with a 55-foot tall and 100-foot wide entrance, and concrete walkway extending 550 feet inside. It was once inhabited by Osage Indians and believed to be used for Civil War-related activities. It was the first documented cave in the Ozarks, thanks to Schoolcraft and the journal he would later publish. The present day name of the cave, and the stream that passes through it, comes from Gerry and Jane Smallin, who purchased the property in 1852. “The roof of this cave used to go past even the Schoolcarft sign down there. And over the millennia, has collapsed back to this point. So as big as this cave is now, it was even bigger in the past,” says Fuller. Eric Fuller prepares to lead a group of students from Stockton into Smallin Cave. 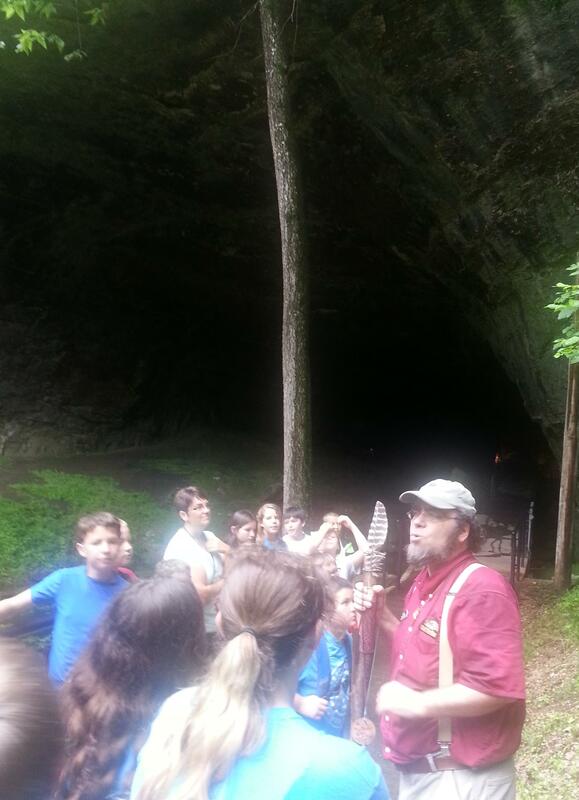 We’ve tagged along with a group of fourth through eighth-grade students from Stockton on its tour of Smallin Cave. Our guide is staff archeologist Eric Fuller, who outside of giving tours has been working with the Osage to create a publication analyzing how this land was used during the tribe’s occupation. Referencing his chin curtain beard and bushy eyebrows, Fuller directs the students to signage just outside the cave’s entrance. Throughout the roughly hour-long tour, Fuller offers evidence of the cave’s Civil War connections, and points out examples of its many formations and environmental data, as well as its wildlife inhabitants, past and present. Smallin Cave is one of more than 800 caves in Christian County alone. Kevin Bright and his wife Wanetta own the landmark. “And every year, almost on a daily basis we’ll pick up a little bit more of that Ozark history,” Kevin Bright said. But despite the significant history it holds, it was only recently that the cave became a public attraction. The Brights purchased the property in 2009 from the Assemblies of God Church, which had used the cave and its surrounding property for retreats. They opened it for tours the following year. And crews have since put in a lot of work to uncover and preserve the cave’s history. While the students’ “oos” and “aahs” may be muffled by the running water, Eric Fuller can see on their faces how valuable this tour can be. It’s an opportunity, he says, for youth and others to understand how people used to live on this land. “I think that’s really important because sometimes we get an idea as to well, you just live in the Ozarks this way. In reality there’s a lot of different ways in which people can live in this region. And by sharing those historic accounts, they get a broader perspective of how life can be in this region,” Fuller says. “I liked going into the cave and seeing the big part where they put their names and all the stuff on there,” says Cox. 12-year-old Ciera Cox is referring to a section of stone pointed out during Fuller’s tour on which soldiers carved their names around the year 1860. For Ciera, it’s a visual confirmation of the history lessons she’s currently receiving back at school. 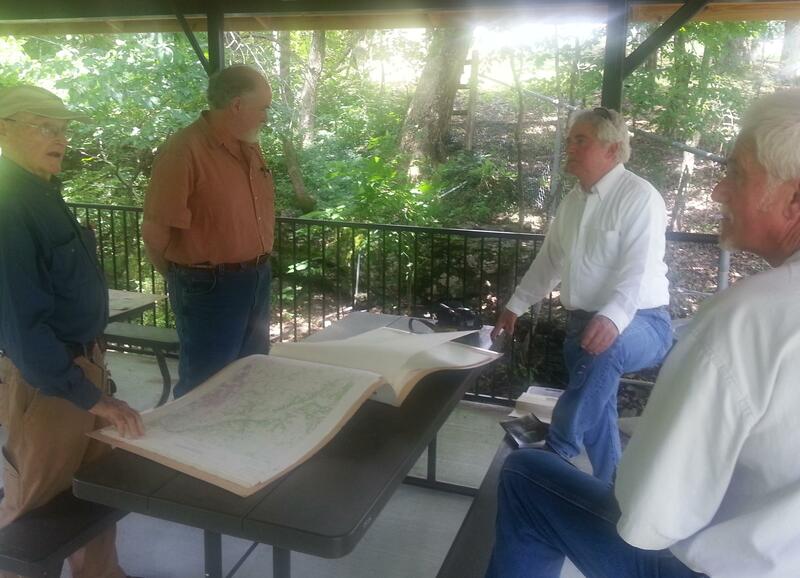 From left; Dr. Milton Rafferty, John Bradbury with the State Historical Society of Missouri, Jim McFarland with Trillium Trust, and historian Lou Wehmer discuss Smallin Cave and Henry Schoolcraft's journey through the Ozarks. And that’s pleasing to people like Jim McFarland with the West Plains-based Trillium Trust. Smallin Cave is one of dozens of sites that McFarland wants to learn more about as part of Trillium’s Unlock the Ozarks initiative. Earlier this year, the nonprofit organization received a $7,500 grant from the Missouri Humanities Council in support of the project. “I think there’s approximately 50 campsites along the way that we should be able to document real well and get signage either at or nearby of those that would also feature QR or Quick Response codes,” McFarland says. Those QR codes can be scanned with a smartphone, taking visitors to a website to display topographic maps from Dr. Milton Rafferty, for instance, as well as entries from Schoolcraft’s journal, and historic and present day photographs. So with the help of officials at Trillium Trust and Smallin Cave, these maps and other written accounts of history in Christian County and throughout this region are and will become more accessible to the public.